This week we begin a new series though, four episodes on the Romanian campaign of 1916. Romania would not enter the war until late in 1916, their path to this decision to enter the war was long and winding with the negotiations with the Entente taking many twists and turns. However, even though the path would be long, once they entered the war they would be met with swift and decisive action by the Germans, Austrians, and Bulgarians. This would result in them being for the most part out of the war once again by the end of the year. The story behind this quick exit from the war will be the majority of our topic for the next four episodes. This episode however will be focused solely on what the Romanians were doing before 1916, how they came to enter the war, and then what they had available to them to make war on the scale that 1916 demanded. Next week we will start with the Romanian attack that they would launch shortly after declaring war. I think that this story is really interesting, and I am very excited for the next 4 episodes because it touches on a theater that many books barely even mention, and if I am completely honest I did not even know existed 5 years ago before I started this podcast. Before the war Romania had a lengthy history of alliances with the Triple Alliance of Germany, Austria-Hungary, and Italy. They had signed a new treaty in 1883 which they then renewed multiple times, the last being 1913. The reason that this alliance seemed so strong was because of the fear of the Russians, that is what drove the Romanians to an alliance with the Triple Alliance. However in the years immediately preceding the war the relationship between Romania and the other countries in the alliance began to fray. The biggest reason for this was after the Balkan Wars, it seems like everything in the Balkans in 1914 is just a reaction to the Balkan Wars, but at that time Austria did not support Romania in its claims after the war was over. Romania was hoping to expand its territory during these wars, and Austria did not put its weight behind these demands and because of this Romania began to look elsewhere for allies. This did not prevent them from renewing the treaty in 1913, but it did cause them to start having conversations with the French. These conversations began even though the royal family of Romania was related to the Kaiser and was a Hohenzollern off shoot. This dichotomy of the Royal Family and public opinion, which supported the Entente, would end up playing a role in both how Romania entered the war and how the other countries reacted to it. The French really wanted Romania on their side, or at least to not side with the Germans, and all they had to do to make this happen was find a way for Romania and Russia to play nice with each other. The two countries had a rough past but when the new Romanian Prime Minister, Bratianu came into power in January 1914 he favored shifting Romania's orientation to be closer to that of France and Russia. This did not mean that decades of animosity were smoothed over in one day though and there were still to be some rocky times for the Romanian-Russian partnership. Russian Foreign Minister Sergei Sazonov would say that 'Romania will try to join the side which proved to be the strongest and which is in a position to promise the greatest profits.' Overall the Russian attitude was simple, they did not want the Romanians to join the war on the side of the Germans, but they also didn't really want them to join their side either. Romania and Russia share a border that is hundreds of kilometers long and the Russians were concerned that if the Romanians joined in the war and did poorly then Russia would be on the hook for defending that territory. Up to this point they had been able to use Romania as a sort of shield for their southern border but this would no longer be the case if they entered the war. This evaluation put very little stock in Romania's military capability. Now, the Russian military was wrong about a lot of things before 1914, and a lot of things during the war as well, however they were absolutely correct in what was about to happen when it came to Romania. That is getting a bit ahead of ourselves though, so lets start back in 1914. When the war started King Carol had to tell Germany and Austria that Romania would not be mobilizing its army in an attack against Russia. As soon as this was done Romania because much more free to shop around to see what they could get for their entry and also to just see how the tides were flowing before jumping in. In these efforts they were led by their Prim e Minister Ion Bratianu. He led all of the important negotiations with other countries and by all accounts was intelligent and well-educated. He would deal directly with many of the representatives sent by the other great powers, instead of letting them be handled by the Romanian diplomatic services and he had the full support of both the king and the Liberal majority of Parliament in his actions. Because of this he had a pretty wide birth in which to negotiate which could best be described as slowly, cautiously, and calculating. Now what precisely would he be negotiating? Well Romania, like Bulgaria, Italy, and the Ottoman Empire was looking for the best deal and the most appetizing piece of any deal would be parts of Austria-Hungary, this became even more appealing after the war continued to drag on and Austria-Hungary did so poorly. This was something that the Entente could offer, since the idea of completely dismantling the Austro-Hungarian Empire was a topic discussed widely in London and Paris. The discussions of which bits of Austria-Hungary Romania would get would drive many of Romania's actions until it entered the war and its actions once it did declare war. The first real offer was brought to Romanian attention on October 1, 1914 by the Russian government. The goal of this offer was to get Romania to agree to enter the war, but only at the time of Russia's choosing. The Russians hoped to convince the Romanians to play their part in the final destruction of Austria-Hungary by unleashing them at the opportune moment to cause the greatest damage. However, when they opened the negotiation door and inch to discuss this with the Romanians they pushed through the door completely. Shortly after giving the message to the Romanians the Russian diplomats got a response. In this response Romanian demands went far beyond just the territory that the Russians were offering, or the territory that was made up primarily of ethnic Romanians. Sure the Romanians wanted those territories too, and they were most of Transylvania and southern Bukovina, however they also wanted northern Bukovina, which was primarily populated by Ukrainians, areas along the Tisza river, populated by Hungarians, and territory of Banat, which was mostly Serbians. This was a lot of territory and the Russians were so put off that they mostly dropped the subject until the middle of 1915. This was all part of the game though, Bratianu was asking a very high price, probably completely understanding that it was highly unlikely that Romania would get all of it but that was okay, it was part of the negotiations. The Romanians probably were never going to enter the war at this point anyway, it probably looked far from certain what would happen. One piece of the puzzle that the Romanians were great at was keeping secrets from other nations. Until they entered the war the Entente was in doubt as to whether it would ever happen and the Central Powers would believe right up until they declared war that they were not going to enter. This deception would go on for almost two years. IN the summer of 1915, and right around the time that the German advance through Poland and into Russia had reached its zenith Russia was forced to go back to the Romanians to reopen discussions. The Russian mindset when opening these discussions is important, they were hunting for something, anything that could stop the advance of their enemies. On July 21st this resulted in the Russians telling the Romanian representative in St. Petersburg that the Russians would agree to all of their demands. However, even this did not make the Romanians jump instantly into the war, instead they decided that maybe now wasn't the time. If you look at the situation it is hard to blame them. The Russians were in full retreat, and looked to never recover, and the Romanian ambassador to Russia could see what the Russians were doing he would write that "After Italy entered the war and while the Russians were at the Carpathians, we were told that our help was of no special importance. On the very day when Przemysl fell, they let us understand that we might be granted the border along the Pruth and Czernowitz; after Lvov was evacuated, the rate of concessions escalated; almost on the day of the German occupation of Warsaw, all of the demands were met" Because of these factors instead of signing the agreement he said that he had to go back and check with his government, and after doing so he informed the Russians that he had been instructed not to sign the agreement. At this point Bratianu was playing for time, it was just simply not a good time to join the Russian war effort, they were in full retreat. As these discussions dragged on the situation changed again, pushing Romania further away from joining. With the Bulgarian entry into the conflict, and the defeat of the Serbians, Romania was now facing not one but two very dangerous neighbors, both of which were still full of fight. A key role in the climax of all of this maneuvering was played by the Brusilov offensive. It was during the offensive that it looked like the Entente fortunes were finally changing and the offensive seemed to be the first of many successes with the Austrians appearing to be on the edge of collapse. It was due to this that during the summer Bratianu decided it was the right moment. However, now it was time for the Russians to begin having doubts again. They believed that the Brusilov offensive the front would stabilize and so maybe the situation was back to Romanian entry being a liability. This was was just reinforced when Alekseev, the Russian army leader, found out that the Romanians wanted Russian troops sent to help them out as soon as war was declared. This negative mindset from Alekseev would slowly change as it appeared that the Brusilov offensive was slowing down and was not going to bring about the great results that were hoped for after it began. He was also getting pressure from Joffre and other western leaders to get on board the Romanian hype train. Alekseev and other Russian leaders would eventually be persuaded, and after this long winding process that lasted over two years it was time to define the exact terms under which Romania would enter the war. On July 4th Bratianu decided that now was the time and announced that he was ready to sign an alliance. However, he put down three conditions upon which this offer was predicated. First the Entente had to supply both arms and munitions. Second, the Allies must take offensive actions on other fronts to prevent the diversion of troops against Romania which also meant that Russia could not voluntarily retreat from the area of Galicia that it captured during the Brusilov offensive. Third, Romania needed unconditional security against a Bulgarian attack. This last one was the sticky wicket in the lists of demands because it meant 2 things. First it meant that the Romanians would need Russian troops, and they wanted 200,000 of them to put on their southern border. It also meant that the French and British troops in Salonika needed to attack north and into Bulgaria. It was this final condition upon which the events of the next several months would revolve around. For the Russian troops, when pressed, they said that they could not promise to send more than 50,000. This was not even close to enough for what the Romanians had planned, they basically wanted to completely offset the Bulgarian troops with Russians. To protest this reduction Bratianu threatened to not declare war on Bulgaria at all, which was just a comical threat for reasons that will soon become apparent. s for the attack out of Salonika, the terms signed very specifically stated that the troops there would began an offensive against the Bulgarians no more than 8 days after Romania entered the war. 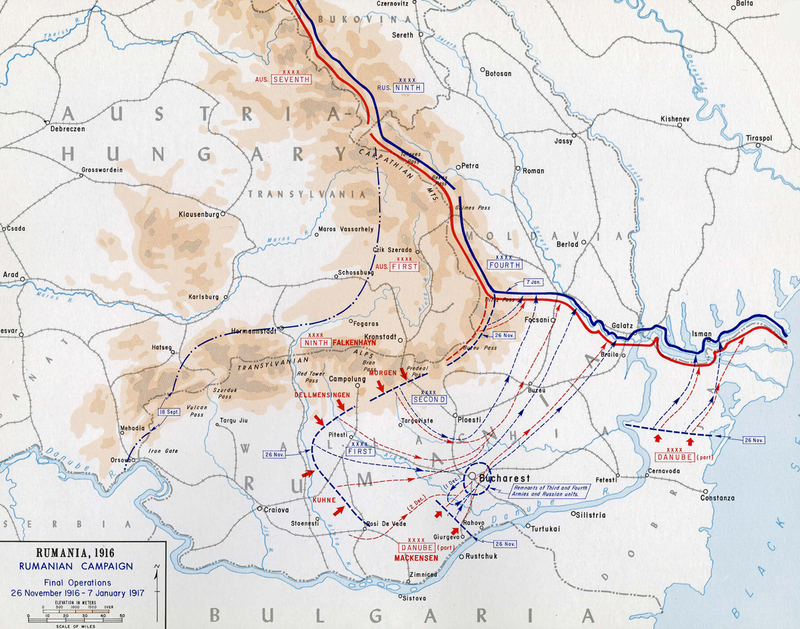 The Romanians believed that this committed those troops, still led by the French General Sarrail, to an energetic and prolonged offensive to try and break through the Bulgarian front. However, the French and British interpretted it as just an attempt to hold down all of the Bulgarian forces currently on that front, not an actual concerted effort. This misunderstanding, or perhaps more appropriately this underhanded change by the Entente would have serious ramifications for Romania almost immediately. As for what the Romanians expected for their contribution, well those demands remained roughly the same. They wanted Transylvania, Bukovina, southern Galicia, the Banat, and some other Hungarian territory. All of this would be given to the Romanians in the peace treaty, at least in theory. In reality it seems that the Entente, while they did sign the agreement, did not intend to fully honor it and in fact the agreement with Romania, as well as those with other countries would be a series problem in 1919 when it came time for debts to be paid. Regardless of all of these things that were in the future, on August 17th the final agreement was signed. Romania was only obliged to declare war on Austria-Hungary however as soon as she did Germany, Bulgaria, and the Ottoman Empire declared war on Romania, making Romania's hope of just fighting a single front war a fool's hope, although not unexpected. War was officially declared at 9PM on August 27th when a courier delivered the official declaration in Vienna. Romanian mobilization had already begun but would not be publicly proclaimed until the afternoon of the 28th which meant that almost instantly 800,000 troops comprising 23 divisions were on their way to either the border or their stations as part of the Romanian war plan. Initially the declaration seemed like a disaster for the Germans and it was the end of Falkenhayn as Chief of the General Staff, as he had just recently assured the Kaiser that Romania was not going to enter the war, and even if it did the declaration would not come until at least late September, probably later. However, just in a general sense it seemed like another huge negative for Germany in a year of negatives, yet another enemy, yet another army against them, yet more troops marching towards them. We will discuss Germany's response in a bit more detail next episode, but for right now lets talk about Romania. After its long neutrality Romania was finally at war, but the question was, what did they have to go to war with? In total there would be 800,000 men mobilized in August 1916 which would form up into 23 divisions. These divisions were not very uniform though, they ranged anywhere from 17,000 to 27,000 men and the men in them were mostly from the peasant class, at least half of which could not read or write. They were however accustomed to hardship and sacrifice and most people were in agreement that they were good raw material to build an army out of if they had good organization, equipment and leadership. They did not good organization, equipment or leadership. First there was a critical shortage of officers with only 820 captains trying to manage 1,701 companies. These officers usually had almost no experience and unlike in Western Armies where promotion from within the ranks of volunteers was a good way to bolster the officer corps, in Romania this was a challenge since so many men were illiterate. Overall, it might have been for the better if the Romanians had mobilized less men than the 23 divisions because it would have allowed for a higher officer, machine gun, and artillery concentration per private. The higher officers were just as unprepared for the situation and this is evident by their tactics. Generally the Romanian army would go to war in late 1916 in much the same way that armies had done elsewhere in 1914. Lots of frontal assault, lots of reliance on the elan of their troops, and not much of anything else. There was some awareness, and some literature provided, around the changes that had been happening on the Western Front. However, these were generally discounted by Romanian officers as either not indicative of the situation for their army or simply too difficult for them to put in place with their inexperienced conscript army. So instead of changing their plans they just doubled down on their pre-existing beliefs in human valor and bravery much like the French had done in 1914, this would have similar disastrous results. Before the war the Romanian economy had not allowed for a full retooling of the military and it was one of the lowest spending, per capita, in all of Europe. This meant that in 1916 there were series deficiencies in critical items like machine guns, with the best regiments having only a handful and many reserve formations having none at all, then when compared with the 18 to 24 that the Germans would be bringing with them. They also had outdated and obsolete artillery guns. Even if you included the most outdated models they still could only field 50% of the field artillery and 30% of the heavy artillery of their opponents, this even included the Austrian and Bulgarian units who would get infusions of German guns. They also had no mountain troops, and had only 2 batteries of modern mountain artillery. This is quite bad when you realize that 600 kilometers of the Romanian frontier, and that which was guaranteed to be a point of fighting with the Austrians was along the Carpathian mountains. All of these deficiencies combined meant that the Romanians would be heavily outgunned on all sides, while also facing armies with field experience, even the Bulgarian units, or at least the officers of those units, often had experience fighting in Serbia and Salonika for up to a year, and certainly knew their way around a trench. Finally, we come to what could have been the great equalizer, leadership. The Romanian General Staff had been created in 1882, but it only been an at-need organization until 1907 when it was established permanently. When war raged in Europe the Chief of the General Staff was General Zottu. He was created by apparently everyone as unfit for the position, but he would still stay on until 1916. The Secretary General of the Ministry of War was General Iliescu. Through his position he had a hand in preparing Romania from war, but he did not have much influence over the actions of the General Staff. That body generally shunned outside influence or intrusions into its plans. All of this was bad, but let's not mince words here, the Romanians were in an almost impossible situation. They had an experienced army, they did not have enough guns, agreements with the Entente prevented the most prudent course of action which would have been to stand on the defense, and finally Romanian public opinion also prevented that course of action. A Romanian professor, Nicolae Iorga, would say that "Public opnion had been molded for the invasion of Transylvania, no one could have been able to impose another direction on the Romanian flag." These facts shackled the General Staff to a risky attack, and that risk simply would not pay off. Our final topic for today is the Russians. The Russians would play a part in all of this planning and the agreements, really everything. Even though Alexeyev would never believe that bringing the Romanians into the war was going to be a great move, he was still obliged to support them once they did. However, they would never work well together, Alexeyev would since less troops than the 200,000 the Romanians wanted, with just a total of 50,000 men sent in the initial wave. There was also a general feeling of superiority in the Russian officer corps, a feeling that the Romanians were worthless. As these types of feelings often do, this trickled down to the rank and file as well. Before the war the Russians and Romanians had not gotten along very well, and while at a state level they had reconciled on an individual level there was still a good amount of contempt between the Russian and Romanian infantry. They generally felt that their Romanian counterparts were poor soldiers, and this was not helped by the first experiences of some Russian units. There are multiple stories of Romanian units surrendering to Russian ones, believing them to be their Bulgarian enemies. These negative feelings then resulted in negative actions. The Russian troops in Romanian heavily requisitioned supplies from the countryside, it was to the point where it is probably more accurate to call it sacking. The leadership also refused to support Romanian attacks out of Romania, and instead they wanted the Romanians to give up most of their country so that a defense could be better organized. All of these problems would create what might best be described as a toxic work environment, and it would only get worse when the action started. Speaking of the action, that will be the topic of our next episode where the Romanians bravely thrust their armies into enemy territory and then…stop…because why not. This is our second episode on the Romanian campaign. Last episode we looked at the run up to the war and the terms under which Romania entered on the side of the Entente.